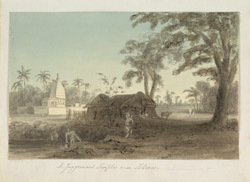 Water-colour, pencil and ink drawing by Marianne Jane James of a temple near Ishera in West Bengal, dated 1828. This drawing depicts a temple in a village of West Bengal. The temple is of the rekha or sikhara type, typical of Bengali architecture, with a curvilinear tower over the sanctuary crowned by a kalasha, a pot finial; it is preceded by an arched verandah.